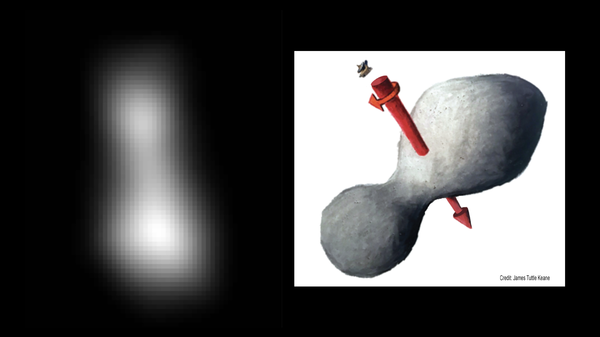 Left: the best current image of the minor planet known as Ultima Thule. Right: an illustration of one possible appearance of the distant object. Its rotation is shown in red. It's known as Ultima Thule — "beyond the known world" — but on Tuesday a minor planet got a little less mysterious. NASA's New Horizons probe successfully conducted the farthest-ever fly-by of an object in space when it sped past Ultima Thule in the first minutes of 2019. "We have a healthy spacecraft," announced the mission's operations manager, Alice Bowman, as signals from the probe reached earth hours later. Stored on board are close-up pictures of the celestial body that's less than 20 miles wide, and four billion miles from the sun. The first images, just a few pixels across, arrived Tuesday morning and revealed a floating mass shaped like dog-bone, a peanut or a bowling pin, depending on your interpretation. "Even though it's a pixelated blob still, it's a better pixelated blob," said project scientist Hal Weaver at a press conference. Sending photos from the edges of the solar system requires patience; while the first high-resolution photographs of Ultima Thule will be revealed later this week, the highest-resolution images won't be available until February. It will take many more months for all of the scientific data gathered by the probe to reach researchers back on earth. The New Horizons spacecraft was launched in 2006, charged with exploring the region beyond the planets closest to earth. As NPR's Nell Greenfield-Boyce reports, the probe has already proven invaluable to scientists. In 2015, it reached Pluto, and what had long been just a fuzzy circle in photographs was revealed to be a stunning, dark-reddish world made of frozen nitrogen and methane, with ice mountains. ... After speeding past Pluto, this mission always planned to visit another icy world, given that it was flying through a region of the solar system called the Kuiper belt that's littered with thousands of small, icy bodies. But it was tricky to find a minor planet that was reachable with the spacecraft's remaining fuel. Scientists used the Hubble Space telescope to find their candidate — Ultima Thule. NASA describes it as "the farthest, most primitive object that humanity has ever seen up close." When this mission wraps-up, the New Horizons probe will still have, well, new horizons. It will start by continuing to explore the Kuiper belt, but could be directed to do another fly-by of a distant object, according to NASA. The team says it has enough power and fuel for 15-20 more years of work, and new software could be uploaded to the spacecraft to enable new missions. For now, the project's main limitation is a more terrestrial one: funding. While the New Horizons mission has set its own record, it's not the furthest a probe has been sent into space. In November, Voyager 2 joined is its sister ship Voyager 1 in interstellar space, more than four decades after being launched from Earth. During the course of their 11-billion mile trip, they snapped stunning photos of Uranus, Neptune and Saturn.